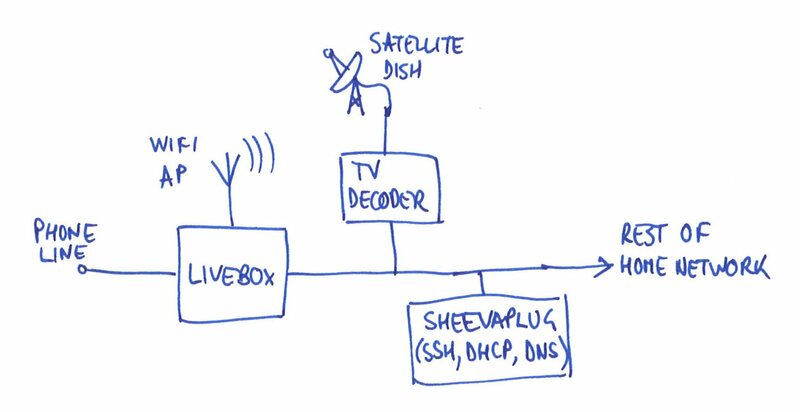 A long time ago, I wrote an article about how I worked around the lack of NAT loopback support on the Orange LiveBox broadband router. At the time, it was a pain to get everything working right. Having just moved house, we made the sensible decision to stay with the same broadband provider, in order to avoid having to re-invent or at least re-configure all this stuff. Well, it turned out not to be as easy as that. Nothing ever is, it seems. The new Orange broadband service comes with a ‘FunBox‘ instead of a ‘LiveBox’. Fun? Who said? Not in my experience. The web interface to the box looks comfortingly similar to the old LiveBox, so I thought it would work the same way. No chance. What’s the problem I’m trying to solve here? Well, I have a little SheevaPlug which hosts some services I need to use from various locations when I’m working. Yes, I know I should put those services ‘in the cloud’, but that would involve both paying money and solving a whole load of other problems. For years and years, I’ve simply had a port forwarding rule set up on my home broadband router so that the SheevaPlug is accessible from the internet. A little touch of dynamic DNS courtesy of dyn.com and it’s all worked fine. the SheevaPlug hosts my ssh server, and provides the DHCP and DNS services to everything on the network, so I get proper local hostname lookups, easy-to-manage IP addresses, and can solve the NAT loopback problem. That’s it. I tried to set up the FunBox the same way. What could possibly go wrong? I boldly switched off the DHCP and DNS servers in the FunBox and switched over to using the ones on my SheevaPlug. Everything seemed to work fine, except…the TV. Yes, the TV decoder is connected to the FunBox via Ethernet, so the whole shebang comes down the wire. No aerial required. Trouble is, the FunBox seems to need to set up the TV decoder by DHCP otherwise it doesn’t know it’s there, so you get no telly. Oh well, I’ll use the DHCP server in the FunBox and put up with the inconvenience. Even that doesn’t work out. In order to solve the NAT loopback problem, which the miserable FunBox suffers from just like the LiveBox, I need to run my local DNS server. Except that the brain-dead FunBox won’t let you change the DNS settings on its built-in DHCP server. How annoying is that? OK, accept that NAT loopback will remain a problem. Maybe I’ll find another way round that. Now for the showstopper: the blessed FunBox refuses to forward port 22. It will forward every other port under the sun, but not 22. The web configuration interface just won’t accept the setting: it ignores it. Doesn’t even give an error message. You’re just not having it. Oh well, maybe I have to expose my ssh server on a different port and put up with changing all the gazillion clients which know about it. Except I’ve still got the loopback problem. This is getting unpleasant. Before tearing out what little remained of my hair by this point, I slept on the problem and had a brainwave. The FunBox supports a ‘DMZ’ feature, in which it’ll forward all incoming internet traffic to a particular IP address on the LAN. I tried it, experimentally sending all internet traffic to the poor, naked SheevaPlug, and it worked! At last, sweet relief: something which does what it says on the tin. Clearly exposing the server in all its complacent insecurity to the internet isn’t a good idea. I needed to put a firewall in the way. A rummage in the cupboard produced a spare Raspberry Pi and a USB to Ethernet adapter. I programmed OpenWRT on to an SD card and booted up. It turned out to be easier to configure it through the command line than with the web interface, LuCI, which isn’t exactly finished yet. Some fiddling later and I’d managed to disable its DHCP and DNS features and enable incoming connections only on port 22. Adding the firewall had another bonus: it meant I could re-enable my DNS and DHCP servers and let them look after the LAN without the wretched FunBox knowing anything about it. It just has to live a simple life, looking after the telly and the firewall. I disabled its built-in Wi-fi access point and added an ageing Linksys WAP54G running DD-WRT software after the firewall. Lovely. There is one fly in the ointment: the Raspberry Pi turns out to make a rubbish router. Our 30 megabit internet connection is reduced to 3 megabits on its way through the Pi. I don’t know if it’s something to do with my configuration, or the release of OpenWRT (15.05-rc3) I’m using. When I’ve unpacked enough boxes to find another router, I’ll try that. This entry was posted in Projects, Raspberry Pi and tagged funbox, orange, Raspberry Pi, security on August 19, 2015 by martinjonestechnology.